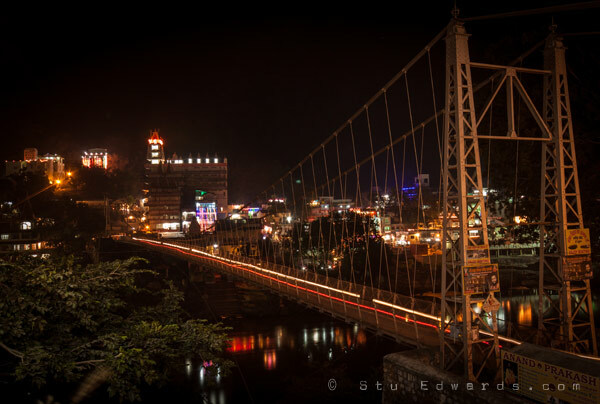 After a long stint in McLeod Ganj, we were about ready to head back to the ‘real’ India. 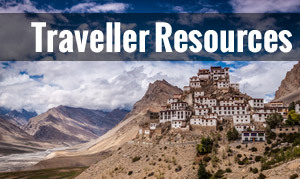 Rishiskesh was our next destination, about 13 twisty-mountain hours south from McLeod Ganj. 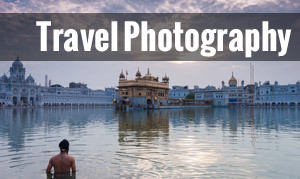 Yoga, temples, Sadhu men, Ghats, cows and full-on Hinduism! 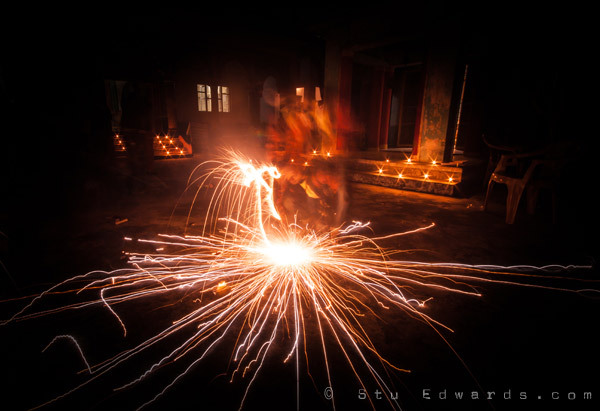 We arrived a few days before Diwali, a major holiday in the Hindu calendar. Known as the ‘festival of lights’, Diwali translates to “row of lamps” (Check out the much more informative Wikipedia entry). 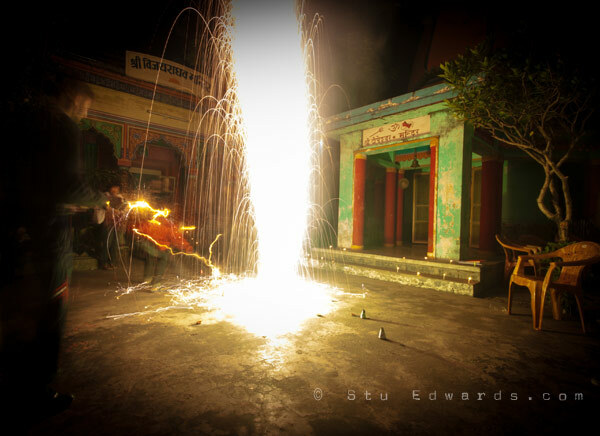 “Diwali – Festival of Lights” should be known as “Diwali – Festival of f***ing loud fireworks“! 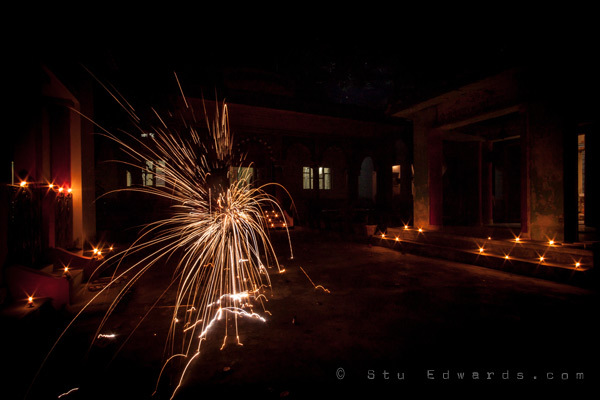 For several days before Diwali, Eloise and I were walking around like shell-shocked war casualties, scared of more massive fireworks going off right by our feet! 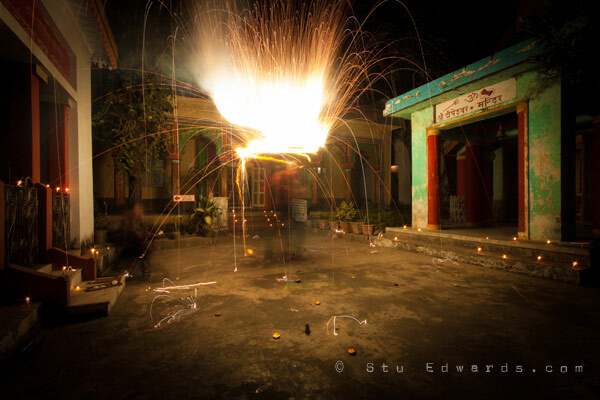 Incredibly loud fireworks rang throughout the Rishikesh valley during the nights, usually followed by a loud “Whooo!” by the culprit who let it off! 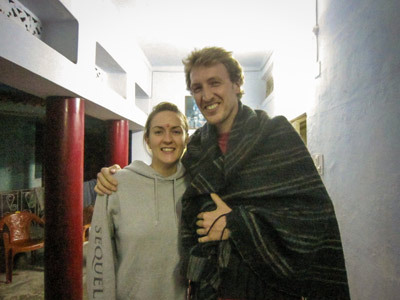 Eloise and stayed in an ashram (not quite as crazy as the ‘hugging mother’ ashram) near the Lakshman Jhula foot bridge in the north of Rishikesh. 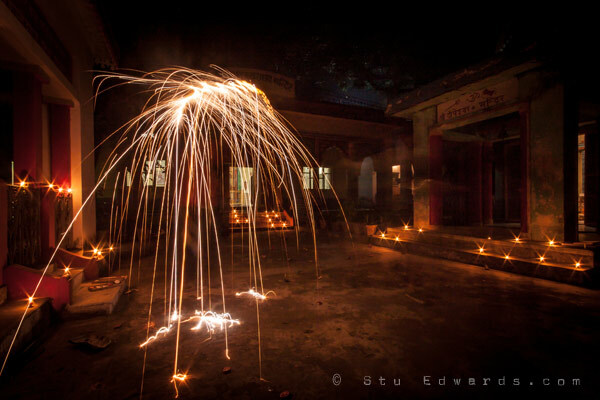 The fast flowing Ganges, the beautifully lit up temples and near-constant fireworks made an excellent back drop to enjoy Diwali in proper Indian style. Totally by chance, I saw on Facebook that my friend Liz from school was in Rishikesh studying yoga on a month long teacher training course. We hadn’t seen each other for about 16 years since we left secondary school, and it would have been silly not to meet up for a chai since we were both in Rishikesh! It was great catching up, and had a laugh reminiscing on old school memories. Liz was kind enough to invite us to her yoga school where they had a fireworks party organised, and they’d clearly gone all-out with the fireworks! Coupled with some hilarious safety practices (hand launching rockets, huge bangers exploding in people’s faces, faulty fuses etc) it made for an excellent evening! They even fed us at the end of it all. 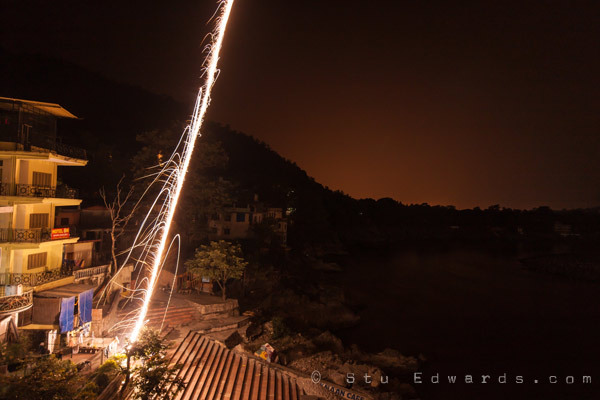 But more importantly dangerous firework practices makes for some cool long exposure shots! 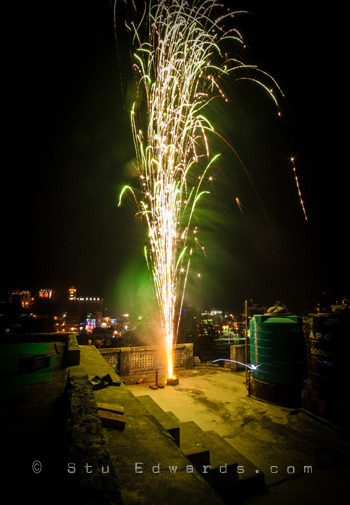 4 Responses to Diwali Fireworks in Rishikesh! 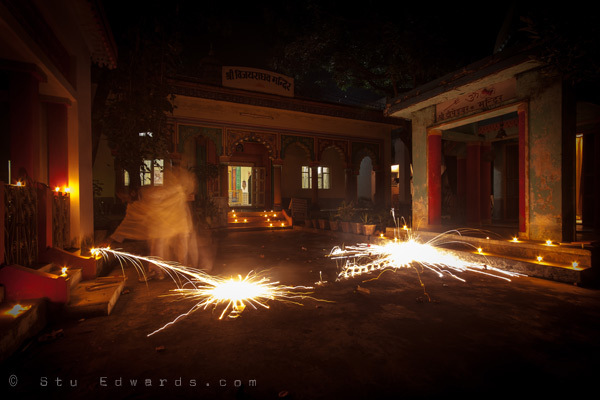 Our last night in Delhi was Diwali, good thing we weren’t planning on naps before our 0200 flight! Your shots are great, I’m a hack with my camera and my fireworks shots were terrible. Probably because I would jump with every loud explosion. India is a magnificent place, isn’t it? It was scary stuff, especially with the lack of safety! All good fun though. 🙂 Definitely needed a tripod for the shots. 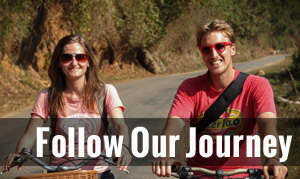 India is incredible, every day brings something crazy and different! 4 weeks left today until we have to leave though unfortunately. I’m in my 50’s and it cracked me up to see kids messing with fireworks much the same way I did years and years ago: standing too close head bent down towards the sparks.